Choosing the right space is key. You’ll want something accessible so that people aren’t already frustrated by the time they walk in the door. Also, make sure your space is clean, modern, easy to find, and has all the amenities. You wouldn’t want to have a beautiful slideshow that goes unseen because they don’t have the right HDMI cord! It’s hard to pass up free food, right? Even the smallest of snacks can brighten someone’s day. Not every event needs to revolve around a meal, but offering a selection of food items for people to nosh on is must for any successful event. People’s faces fall when they overhear that the theme or activity of the event is the same as last year’s. Even if your previous event was a success, people love trying new things. It’s also not all about reinventing the wheel. 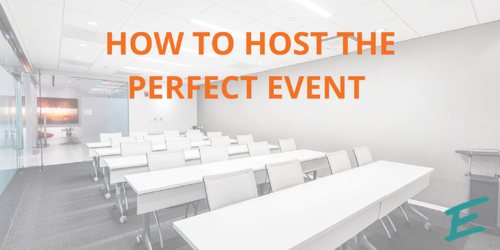 Let’s say your office is putting on an event for a new client. Instead of doing the standard happy hour wine and cheese, try a seasonal theme, like a hot chocolate bar for wintertime. A good hostess knows that details are what brings an event together. Small touches like nice name tags, place cards, or a favor to take home always leave a lasting impression. For example, if your event is to celebrate a company anniversary, get cupcakes with the logo on them! The biggest mistake people make when planning is doing it all themselves. Support is the key to your sanity and a successful event. Chose a space where someone can help from start to finish. Things like printing out menus, meeting the caterer, or setting up water, can drive you crazy when you’re in the moment. Make sure you have a coordinator who is there to make your life easier! At AdvantEdge Workspaces, we ensure that your office events go off without a hitch. 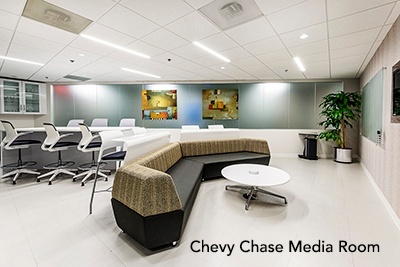 Our client service coordinators assist with logistics and set-up, while our spaces are outfitted with technology that can handle any needs. Here, it is hassle-free to pull off the perfect event, whether you’re a client or just needing the space for a few hours!